During the classical period, life on Paros was supported by the marble quarries, which produced some of the most unique building materials of the age. It was much used by sculptors, too. There was a continious flow of architects and sculptors from all parts of the Greek world who ordered large quantities of the famed Parian marble, and the island's production was even greater than that of Penteli, near Athens. 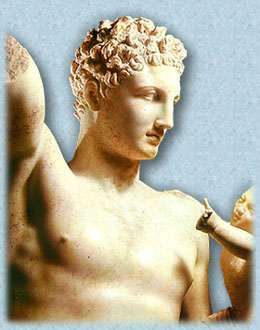 Among the triumphs of Parian marble, one could mention the temple of Apollo on Delos, Praxiteles' statue of Hermes at Olympia, the Venus of Milos,and the temples of Demeter and Asklepios on Paros itself. More information on Paros marble, famous statues of Parian marble and ancient marble quarries.